Liberia, situated in West Africa and bordered by Sierra Leone, Guinea, Ivory Coast and the Atlantic Ocean, is Africa’s oldest republic, and besides Ethiopia the only state on this continent with an uninterrupted history of independence. Initiated by the philanthropic “American Colonization Society” around 1820 as a settlement project for freed American slaves, it was officially proclaimed as Republic of Liberia on July 26, 1847. Up to this time, the transmission of letters had solely been carried out by private couriers. In fact, a syllable-based system for writing down messages and sending them between villages had been in use by the native population since the second half of the 18th century. After the declaration of independence, and due to the many changes in the political, social and economical life that came along with it, the young government soon felt the need to assume control over the mail service, banning any kind of private transport of inland mail. On January 20, 1850, Liberia signed a postal convention with Great Britain, and the first commercial mail contract for carriage via UK package and Liverpool was signed in 1852. Two years later, and armed with a total budget of £500, the first post offices were opened at Monrovia, Buchanan (Grand Bassa) and Greenville (Sinoe), eventually followed by Harper (Cape Palmas). Liberia’s first postage stamps, lithographed by Dando, Todhunter and Smith, London, were issued in 1860. The set consisted of three stamps, one each of 6c, 12c and 24c in red, blue and green, respectively, and all with the same allegorical design of Liberty: a white woman with shield and lance sitting on a rock, safeguarding a ship with freed slaves approaching the coast. This issue was reprinted several times by T.F. Todhunter, but it remained unchanged until, in 1880, new colors were introduced, also adding two new values to meet a change of postal rates suggested after Liberia had joined the Universal Postal Union on April 1, 1879. Given that these first three stamps were the only available for two decades, they are remarkably scarce on cover. There are less than fifteen recorded covers, far fewer than those known of the first issues of Mauritius. Since the day it was established the Post Office Department had never been properly organized. For most of the time it had, in fact, been under the control of the Treasury Department, with the Collector of Customs in Monrovia acting as Postmaster General. Heavily underfunded and suffering from a lack of interest by the person in charge, the situation did not change by much until, in 1892, Arthur Barclay was appointed to the position of Postmaster General. He soon started reorganizing the department, issuing work instructions for the employees and opening new post offices, the most important being the one in Robertsport (Cape Mount). The begin of Mr. Barclays administration also coincides with a new extraordinary stamp issue, but the credits for Liberia’s first pictorials must go to someone else. Henry L. Hayman, Acting Minister Resident in Great Britain since 1891, had already established good contacts with the Liberian administration, when Todhunter decided to give up his printing firm around 1891/92. Hayman, having started collecting stamps at the age of eleven, took the opportunity to step in and obtain a contract with the Liberian government making him responsible for design and production of future stamps. His first stamp issue clearly bore the trademark of a philatelist at work: a beautifully designed long pictorial set with values from 1c to $5, and produced by one of Britains foremost printers, Waterlow and Sons Ltd. The dollar values were issued in small sheets of ten stamps, probably to make them more attractive to collectors. For his 1894 Postage Due issue, he even ordered the production of a proof set of small sheetlets with a single stamp printed in the center. Thus, Hayman did not only create what is now regarded the world’s first pictorial definitive set. He coined the idea of the miniature sheet, too! Last but not least, he is also responsible for the increased number of Liberian stationeries that suddenly became available, personally reporting every new issue to Stanley Gibbons. The last stamp set Henry Hayman was responsible for under his original contract was the pictorial set of 1909, printed by Perkins, Bacon & Company. By 1910, Germany’s influence in Liberia, greatly helped by the popularity of the Woermann Steamship Line of Hamburg, began to increase, and some time before the outbreak of World War I the German importing firm of J.W. 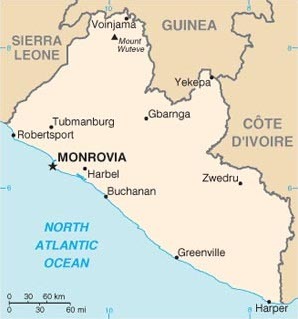 West of Monrovia obtained a new contract for the production of Liberian stamps. Especially the 2c and 3c values of the next pictorial set, designed and printed at the “Reichsdruckerei” (Imperial Printing Works) in Berlin, were urgently needed, and were sent ahead of the rest, safely reaching Liberia in 1914/15. A second shipment to complete the set, addressed to the German agent rather than the Liberian Government, was intercepted by the British Navy, and was not released until several years after the war had ended (finally issued in 1920/21). 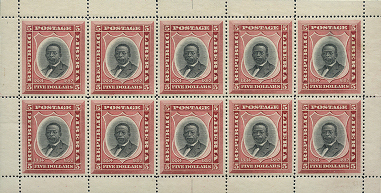 Still in need of stamps, the Liberian government turned to Perkins Bacon, to order a reprint of the 1909 issue. Again, the shipment didn't get through. This time, the ship carrying the ordered stamps had an encounter with a torpedo, fired from a German submarine. Eventually, the result of Liberia being cut off her stamp supply was a series of provisional surcharges during 1915/16, using up surplus stocks of whatever was left. Owing to the primitive local printing facilities, these overprints are full of varieties and errors. By 1917, running low on material available for overprinting the Liberians had to get in touch with Hayman again, convincing him to attend to the production of one more set: Liberia’s fourth pictorials, issued in 1918. However, after the end of the war, Liberia continued to honor the old contract with the Imperial Printing Works, and the next four sets were printed in Berlin, with the last being issued in 1924. Up until now, not a single stamp had been produced in the United States. 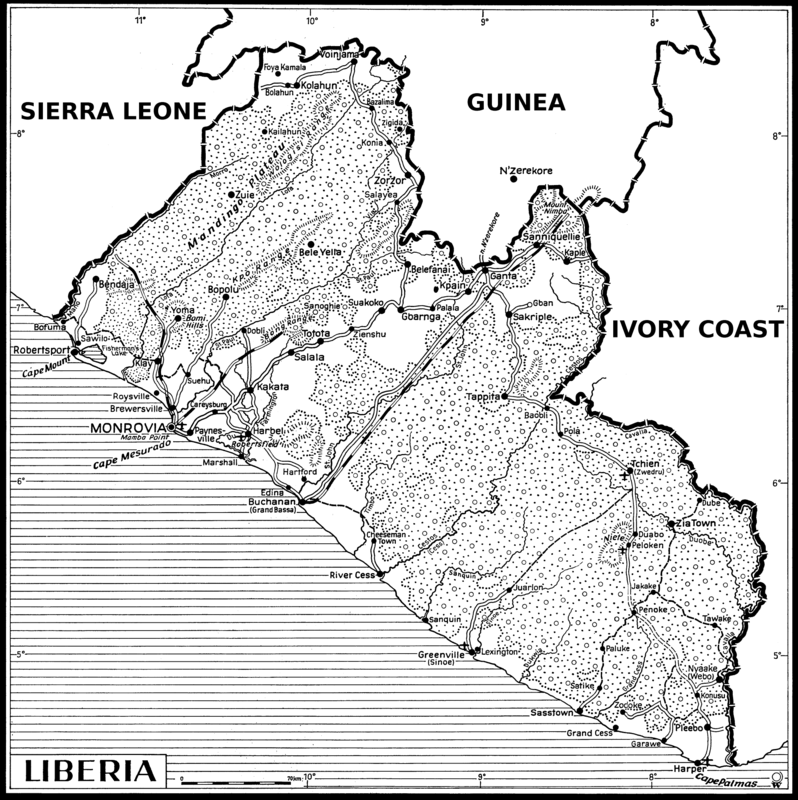 The US not recognizing Liberia until fifteen years after her foundation — while other countries, like Great Britain, acted almost immediately — and leaving the field open for European colonists to take over, had caused the relationship between the two states to cool off over the years. Almost 80 years later, a new investment of the Firestone Rubber Company of America brought a preliminary change to that. Rubber supply had proven to be crucial during the last war, and when Firestone decided to establish plantations in Liberia the deal was sweetened with a two million dollar loan to the Liberian government. Consequently, the next stamp order in 1928 went to the American Bank Note Company. Yet, the plantation project, successfully developed in Panama, had to face unforeseen difficulties, like the red ant eating up portable buildings. Due to some disagreement about the extent of support the Liberians were bound to supply, the advances in the relationship between the two governments came to a halt. That way, the Americans missed the opportunity to be responsible for printing what would be the next cornerstone in Liberia’s postal history: the first dedicated airmail stamps. The first official internal airmail flight in Liberia took place on February 28, 1936, between Monrovia and Cape Palmas. It was sponsored by the Firestone Rubber Company with one of their own airplanes, a single-engined Waco biplane, to help overcome the plantation dispute. For that occasion, the first three values of the 1928 definitive set had been locally surcharged “Airmail / Six Cents”. Maybe there wasn't enough time to prepare the printing, but the actual overprints were extremely poorly executed, even by Liberian standards. The Liberian postal administration certainly welcomed this goodwill gesture, and, aware of its importance, decided to celebrate the event in an appropriate manner with a new commemorative stamp set, to be issued later that year. On September 30, 1936, Liberia issued her first airmail set — showing a Ford Trimotor on six stamps printed by Perkins, Bacon & Company, London. Two years later, Liberia’s first definitive airmail issue was printed by Waterlow and Sons. It was not before 1940 that the Liberians decided to resume business with the American Bank Note Company for a couple more years. From 1945 onward, nearly all stamp issues were printed by the E.A. Wright Company, Philadelphia, until the firm went into liquidation in 1972.